One consequence of living several thousand miles from the place you grew up and shifting residences every few years is that the people you care for tend to die at a distance. Once a year or so I get a phone call to inform me that someone I had assumed alive and well has suffered a stroke, or shot himself, or neglected to wake up. Upon hearing such news I usually feel a brief but genuine desire to drop whatever I am doing and fly to the funeral. Then I recall the funerals I have attended. The very word calls to mind dark suits on a hot day and a room full of uneasy people sitting on hard wooden seats pointed in the direction of a spokesman for organized religion, who, in an attempt to make them less uncomfortable, is conjuring up an implausible illusion of an afterlife. The funeral of my imagination, I should say, is a wasp funeral. wasp funerals are governed by two beliefs: that the public display of emotion is embarrassing, and that khakis are inappropriate. When we wasps meet over a coffin the best that can be hoped for is a stiff exchange and a bit of meaningful eye contact. And so, within a few hours of receiving the news of a friend's death, my urgency subsides and my reasoning commences: It is a long way to go.... It's not as if anyone will care ... he won't even know. Finally: he would have wanted it this way. The first happy exception in a lifetime of ducking funerals came last week, after the death of my father-in-law, Charles H. Bohner. He was a professor of English literature at the University of Delaware, the author of literary biographies of Robert Penn Warren and John Pendleton Kennedy and a novel based on the Lewis and Clark expedition, and the editor of McGraw-Hill's fine anthologies of short stories. I had known him for a little more than a year, most of which he had spent in a losing fight with cancer, but evidently I had become thoroughly attached to him. Upon meeting him, it had taken me about ten seconds to realize that I would not have to pretend to like my father-in-law, and his demise left me with the sense that I had been robbed of a winning ticket in the in-law lottery. Which is not to say I would not have skipped his funeral if I could have. After all, he was a wasp. There may be some people who are made to feel better by such rules, but I am not one of them. Neither, it emerged, were my in-laws. 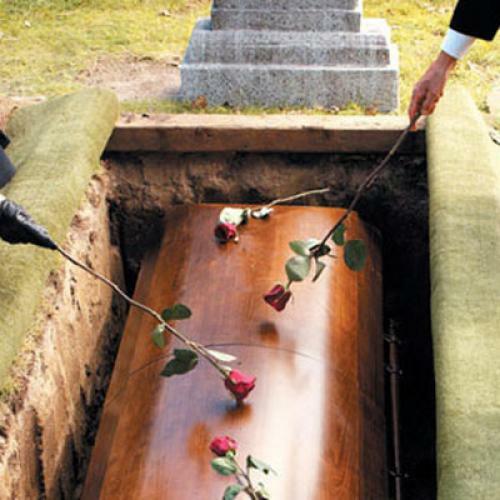 The minute I saw my brother-in-law, Russell, I sensed that Funeral Etiquette was at some risk. He arrived to orchestrate the secular service wearing a blue blazer, khakis and spanking white Keds, and the air of a son celebrating a father's well-lived life rather than a man one needed to feel sorry for. "Did you buy those shoes for the occasion?" one of his friends asked him as he passed through the receiving line, violating the code of conduct and making everyone feel a bit better. A woman who had been informed that she might dress as she pleased arrived in a tight shocking orange mini-dress. Funeral Etiquette retired to its place in the rack. "A eulogy is uncommon at today's funeral service," whispered the offensive pamphlet from afar. "It is not inappropriate, but the eulogy is not to be lengthy, and should offer praise and commendation to the person who has died." While the rest of us sat on soft, comfortable benches, a passionate Castilian painter, apparently ignorant of all rules, rose and described in sordid and lengthy detail his forty-year friendship with a man he could not bring himself to call simply "Charles" and so instead had dubbed, with an endless comical rolling "r", Don Carlos, el mas guapo! (the most handsome, fearless and courageous). When the applause had died down, Don Carlos's three children took turns telling tales of their father--his failures as well as his triumphs--that raised belly laughs from the audience and made the Colonial dames on the walls quake. After the memorial service the family drove the mortal remains of the author and professor of English literature to the Chesapeake Bay. Scattering a man's ashes in the sea sounds easier than it is. The wind was blowing in, the waves were crashing against the rocks, and everywhere we looked there seemed to be a crowd of middle-aged women in bathing suits. Appropriately, there seemed no appropriate place to put him. Finally, it was decided that the best strategy was to climb down a sea wall and discreetly heave the makeshift urn into the Bay. I stood on a slippery rock and pried the lid off the large golden tin while Russell found his footing at the water's edge. I had never before seen human ashes. They aren't at all like what you find at the bottom of the fireplace on a winter morning. They are pulverized gray stones, heavy and flecked with pieces of white. Still they rose in a white puff, as the canister sank, and formed man-shaped patterns on the surface of the bay.